-- Select a Size/Color -- 2.5 oz. package - Coming Soon! 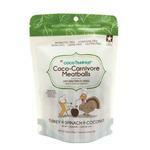 Your dog or cat is going to beg for the CocoTherapy Coco-Carnivore Meatball Pet Treats - Turkey! These freeze-dried raw meat treats are made for the furry meat lover in your life! The CocoTherapy Coco-Carnivore Meatballs are not only delicious but super healthy for your dog or cat. Made with humanely raised meats sourced from USA farmers and combined with super-foods from fruits, vegetables, herbs, and CocoTherapy Coconut Chips. These yummy dog and cat treats are made with 100% human grade ingredients without any antibiotics or hormones. Made in the USA! Extremely cute items for our new Princesses!!! !